At the latest, when the festival season was largely rained out in 2016 one thing became clear: As soon as the weather changes, the fields and meadows at music, sport and outdoor events turn into muddy marshland and wet socks are predestined. Equipped with the overshoes developed by Crimex that can be pulled over one’s own shoes when it is raining, the visitors managed to keep dry feet despite the mud bath at the Wacken Open Air 2016. 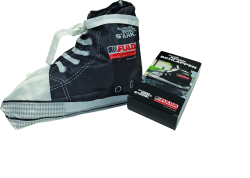 The Rain-Slippers made of 190T polyester with a water-repellent coating were designed for the tyre manufacturer Fulda-Reifen that belongs to the Goodyear Dunlop Group and were distributed free of charge by Promotionteams as walking acts at this and other festivals. Just like the packaging, they were totally produced in the customer’s design. The target group not only gained a direct benefit, but at the same time they were also given a demonstration of the high performance of the purchased tyres under wet conditions. The jury rewarded the successful combination between high practical value and the sensitisation of the users to the demands that tyres are exposed to on a daily basis with a Promotional Gift Award 2017 in the category Best Practice.